Today is Monday, May 15, the 135th day of 2017 in the Gregorian calendar, with 230 days remaining. Donald Trump has been President of the United States for 116 days. There are 1,347 days remaining, assuming he doesn't resign or is otherwise removed from office. On this day in 1928, the Walt Disney character Mickey Mouse premiered in his first cartoon, a silent film called "Plane Crazy", in a test screening before a theater audience. 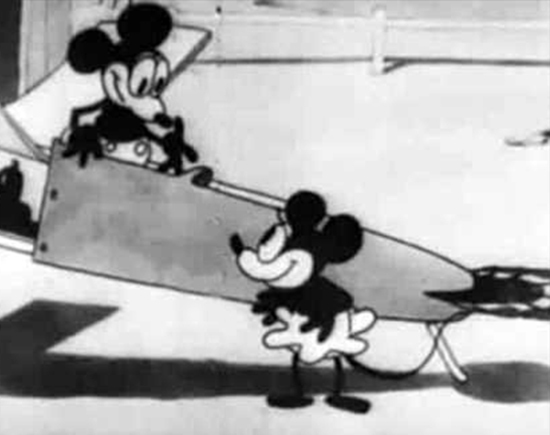 Sound was added, and the film was later released as the fourth Mickey Mouse cartoon, after Steamboat Willie, The Gallopin' Caucho, and The Barn Dance. The sound-added version of Plane Crazy, released a year later in 1929. Among other things, today is also National Chocolate Chip Day. A Florida man who said he was high on meth allegedly tried to hot-wire a car even though the keys were inside, deputies said. "Donald Trump is the only person in the world who can look at the Watergate experience and say, 'tape recordings... now there's an idea!'" NASA denies Trump's request to send astronauts past the moon on new rocket. Putting astronauts on the first flight would have added $600 million to $900 million to the $24 billion price tag and delayed the launch until probably the first half of 2020. A stunningly well-preserved dinosaur "mummy" found in Canada. For paleontologists the dinosaur’s amazing level of fossilization- caused by its rapid undersea burial- is as rare as winning the lottery. Usually just the bones and teeth are preserved, and only rarely do minerals replace soft tissues before they rot away. Eating sushi can give you Anisakiasis. The human sense of smell is better than previously thought. But dogs don't have to be concerned. What if all the ice on Earth melted? The planet would have an average temperature of about 80 degrees Fahrenheit, hotter than the current average temperature of 58 degrees Fahrenheit, and an increase of 216 feet in seawater levels. THe FTC is cracking down on those phony "Microsoft says your computer is broke" pop-ups and phone calls. In a 2014 interview, fired FBI director James Comey warned "You cannot trust people in power."